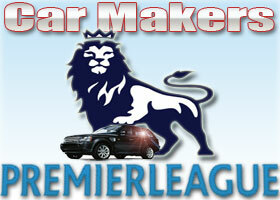 May’s Car Makers Premier League (based on the SMMT figures for UK new car registrations in May 2009) reveals consistency at the top and bottom. The headline figure is a shade under 25 percent overall drop in new car registrations year-on-year but, as always that is only part of the story. This month sees more excellent news for Hyundai who remain in top spot as they record a massive 37 percent improvement on May 2008 and Kia who move up from last month’s 5th position with a very impressive 21 percent increase. It’s been a good month too for Seat who were relegated last month but have sprung back with a vengeance this month, leaping to third place with a creditable 0.5 percent drop. Nissan and Honda also buck the trend this month both recording sub 10 percent decreases. Languishing down at the foot of the table, and seemingly rooted there, is Renault with an eye-watering 64 percent drop in registrations. Bad news also for Jaguar who have been relegated because their May registration figures of just 1,265 have taken them out of the top 20. Vauxhall have dropped down from 11th to 19th with a 40% decline on last year could they be suffering as a result of consumer concerns over the brands future? It’s obvious the headline figure would have been an awful lot worse had it not been for the likes of Hyundai, Kia, Seat, Nissan and Honda who have all outperformed the market this month. Next month will be extremely interesting as the positive effects from the scrappage incentive filter into the new car registration figures and if the stories coming of Hyundai’s UK HQ are true expect them to be still at the top by some distance. Due to its alliance with Nissan, Renault it is currently the world’s 4th largest automaker. It owns the Romanian automaker Automobile Dacia and the Korean automaker Renault Samsung Motors. The Brazilian Carlos Ghosn is the current CEO. The company’s most successful car to date is the Renault Clio, and its core market is France. The company is known for numerous revolutionary designs, security technologies and motor racing. Producing cars since late 1897, the Renault corporation was founded in 1899 as Société Renault Frères by Louis Renault, his brothers Marcel and Fernand, and his friends Thomas Evert and Julian Wyer. Renault became a nationalized company after the second world war and was not privatised again untill 1996, with the Renault–Nissan Alliance comencing in 1999. •	1944 – Louis Renault dies in prison after being arrested on charges of collaborating with the Nazis during WWII. •	1944 – Renault nationalized by the French Government in response to the Nazi collaboration charges against its founder. •	1961 – The Renault 4 goes on sale to give Renault a practical competitor for the likes of the Citroën 2CV and Volkswagen Beetle. •	1965 – Renault launches the world’s first production hatchback – the Renault 16. •	1971 – Renault launches the Renault 15 and Renault 17 two-door coupes, giving it a serious competitor for the Ford Capri. •	1972 – Renault enters the new “supermini” market with its R5 hatchback, one of the first such cars in this sector. On its launch, the R5 only has three similar competitors – the Fiat 127, Autobianchi A112 and Peugeot 104. •	1976 – The Renault 5 Alpine is launched, giving the marque its first entrant into the Hot hatch market. Possibly one of the very first hot hatches, going into production in the same year as the Volkswagen Golf GTI. •	1977 – Renault enters the small family hatchback market with the 14, which is one of Europe’s first hatchbacks of this size. •	1979 – Renault buys a stake in American Motors, with a view to establishing itself on the American market. •	1980 – Renault launches the 5 Turbo, which is designed as a rally car but does include roadgoing versions. It ditches the front-drive, front-engined layout for a mid-mounted engine (in place of the rear seats) and rear-wheel drive. •	1981 – Renault launches the 9 a four-door saloon, a modern three-box design which is designed to keep the market interest in saloons at a time when hatchbacks are becoming the norm in this sector. It is voted European Car of the Year. •	1982 – Renault becomes the second European automaker to build cars in the United States, after Volkswagen. The Alliance, the North American version of the 9, is manufactured in Wisconsin by American Motors and debuts as a 1983 model. It is voted Car of the Year by Motor Trend. •	1983 – Renault launches the 11 – a hatchback version of the R9. It gives Renault its first serious rival to the Volkswagen Golf. It goes on sale in the fall in the United States as the Encore. •	1984 – Renault enters the executive car market with the large 25 hatchback, aimed directly at the likes of the Ford Granada, Rover SD1 and Opel Rekord. •	1985 – Renault launches the Espace – Europe’s first multi-purpose vehicle. It gains praise from all over Europe thanks to its unique practicality and innovation. •	1986 – On 9 April the Government of France rules against the privatization of Renault. •	1986 – Renault replaces the 18 with the all-new R21 saloon and Savanna seven-seater estate. •	1987 – Renault sells its stake in American Motors to Chrysler. •	1988 – The 9 and 11 ranges are replaced by a single model, the 19, which is praised for its excellent ride and handling, as well as the frugality and refinement of its diesel engines. •	1990 – Renault launches the Clio supermini, designed as an eventual replacement for the Renault 5. The Clio is the first new model of a generation which will see the numeric models replaced by new cars with traditional nameplates. It sets supermini benchmarks for build quality, comfort and space, and is voted European Car of the Year. •	1991 – The Renault 19 becomes available as a cabriolet, and a mild facelift sees the standard range’s exterior styling refreshed. •	1992 – Louis Schweitzer becomes president of Renault group. •	1992 – Renault moves into the city car market with its Twingo, a small hatchback with a “cube” design that maximises interior space, though it is only built with left-hand drive. It re-enters the executive market with the Safrane, an ultramodern large hatchback which replaces the R25. •	1995 – Renault 5 production finishes after nearly a quarter of a century. It had been produced in Slovenia since the launch of the Clio in 1990. •	1995 – Renault replaces the Renault 19 with the Megane, a range of hatchbacks, saloons, estates, coupes and cabriolets. •	1996 – The company was privatised to create Renault S.A.
•	1997 – The all-new Espace goes on sale with a more upmarket image than its predecessor, that served the company for over 10 years. •	1998 – The second generation Clio is launched, using an all-new body and being one of the most competitively-priced European superminis, though its styling is not to all tastes. •	1999 – Renault purchased a 36.8 percent equity stake in Nissan, the almost bankrupt Japanese car maker, by injecting US$3.5 billion to obtain effective control of the company under Japanese law. Renault vice-president, Carlos Ghosn was parachuted in to turn round the ailing firm. Nissan also owns 15% of Renault in turn. •	2000 – Renault launches the Laguna II – the first European family car to feature “keyless” entry and ignition. •	2002 – Renault gains another European Car of the Year success with its second generation Megane, a quirky-looked car which is set to form the basis of Nissan’s Almera replacement later in the decade. •	2005 – Carlos Ghosn becomes president. •	2005 – The Clio III is elected European Car of the Year 2006 and gains plaudits from all over Europe for its class-leading qualities. The previous generation Clio is set to continue for a while until the Twingo II goes on sale. •	2006 – In February, Carlos Ghosn announced the “Renault Commitment 2009” plan focusing on three main goals : Sell 800 000 more cars than in 2006, reach an operating margin of 6%, place the new Laguna in terms of quality and service rate. •	2007 – The third generation Laguna is introduced, with the objective to strengthen Renault’s position in the large family car sector. The Korean brands are having a field day. Watch out for the June numbers. You may be even more surprised!